Most pitchers make throwing another pitch more difficult than it is. There is a simple way to throw any pitch successfully without putting undue stress on your throwing arm or changing your throwing motion to do so. 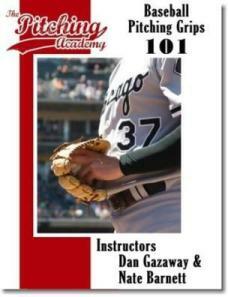 In this Pitching DVD you will learn how to position your wrist and forearm with many different pitches to impart correct rotation on each pitch. Let us simplify the process for you! If you want to dominate on the mound you must learn how to throw at least three different pitches. There are three keys elements to getting a batter out and becoming successful on the mound; movement, change of speed and location. Without these three fundamentals you will surely fail. In this DVD we show you how to throw seven different pitches that will not only keep hitters off balance, it will keep your opposing teams batting average below .300. That means you will win more games! 2) C-Change: Many pitchers think they know how to throw this pitch effectively. Maybe it works for you right now and that’s great. But are you throwing the C at the glove? The real C-change has wicked movement. We demonstrate how to accomplish that in this section when we discuss the release. 3) Circle Change: Learn the difference between the C-change and the circle change. I think the ultimate goal should be to master the true circle changeup more than any others because of the movement that is created when thrown correctly. This pitch has a screwball type effect and hitters knees buckle when they see it. 4) Nate Barnett’s Special Changeup: Nate Barnett is a George Fox University Hall of Famer. Although he was inducted into the Hall of Fame for his outstanding accomplishments at the plate, he also was a successful pitcher. Imagine that! Nate instructs you how he threw his most successful pitch in college. It can work for you too as it has for many pitchers. Bonus: Pitching Drill: Learn a pitching drill that will teach you how to throw different pitches, in half the time, without putting undue stress on your throwing arm. Throw hundreds of pitches like this and learn how to “feel” how to throw each pitch effectively. In this segment I demonstrate how to throw the C-change using this drill. Without proper pitching workouts your body will fatigue easily which directly effects your overall performance. You need to workout like a pitcher to enjoy the full benefits of maintaining your health on the mound. We have put together a few pitching specific workouts here for you that are simple yet very effective. Your goal is not to become bulky but to workout the tendon and ligaments that help support muscles. We show you how to workout properly with light dumbbells and teach you the importance of core strength training. You will love our pitching specific core exercises. What else will you learn in this information packed DVD? What causes pain in the middle of the elbow and the backside of the shoulder. The correct position of the wrist when throwing a fastball and other pitches. How do you teach an athlete not to push the ball when throwing? Learn how to keep a pitchers own style and maintain basic pitching mechanic musts. Correct arm slots- is side arm okay, 3 quarter arm slot or over the top? How do you find out which arm slot is for you?